Map Samples - 2015 Maps of the Month - Maps & Facts Unlimited, Inc. According to CoStar, there were seven (7) single-family land sales over $10,000,000 in 2014. With two "infill" exceptions, all were outside The Loops. This is where we will see more building permits in 2015! Maps & Facts has been tracking what we call the average house price appreciation in order to better understand the price behavior for a representative single-family house. This data base only includes homes built between 1990 and 1999, which sold from 2001 to 2014, for between $100,000 and $1 million. In addition, we have attempted to �clean� the data by eliminating obvious distress sales, related parties, and foreclosures. As the following chart depicts, the average house appreciation from 2013 to 2014 was only 1.25%. The last time the median price was about $243,000 was in 2008 when the median was $244,900 on its way to $182,000. There are many other ways the data could be sliced and diced but we believe that this is one of the more meaningful barometers because it represents the same data set over time. The accompanying map also tells a story that hasn�t changed. 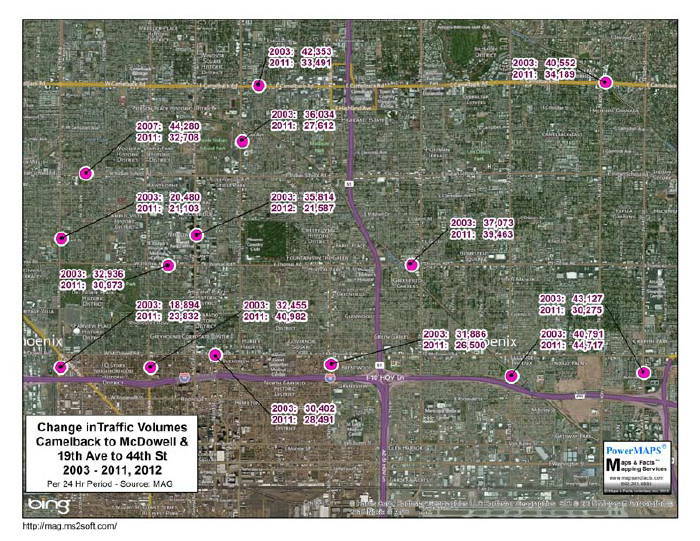 Most sales have been in the Southeast Valley and Northwest Phoenix which makes sense since these were the new construction hotspots in the 1990s. As shown, and while it seems counter intuitive, most sites had less traffic in 2011 than in 2003. We've been advised that both years are accurate. Finally, there is positive excitement regarding the Phoenix office market. As shown on this month�s Map of the Month, CoStar has added at least 8 additional buildings to their Class A inventory. While each building has its own story, including renovation and single users, considering the age of our Class A inventory and the lack of spec construction, this is a positive improvement! The month�s map indicates the percent of (all) housing units occupied by renters as of 2013. As shown, and as expected, renters favor CBD�s, infill, and freeways. Caution, this is a survey from the Census Bureau�s American Community Survey; it is not a census. If more renters become owners, maybe the housing market will turn around! Our May 2008 Map of the Month was entitled �Will Light Rail Help Get Our Inner City Schools on Track?� (Maps of the Month - 2008). 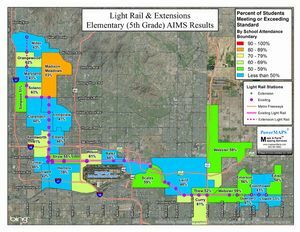 Part of the story was Light Rail�s hope for an impact on revitalizing neighborhoods, attracting families back to central Phoenix, and, implicitly, improving inner city schools. 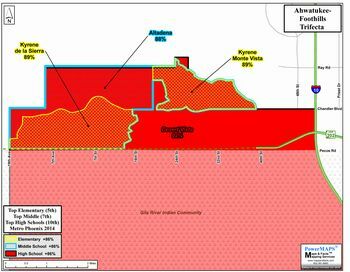 This month�s map shows the original 20 mile route, the 3.2 mile Northwest Phase 1 extension due to be completed in early 2016, and the 3.1 mile Central Mesa extension opening this August. Based on this month�s update, light rail has had little impact on revitalizing neighborhoods or improving school performance. As our clients know, we�ve been tracking school performance as a market based proxy for commercial real estate appraisal, consulting, and litigation for years. 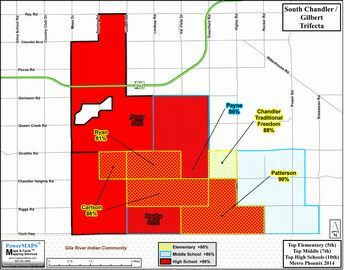 This month�s maps highlight the 14 top (86% plus on AIMS) Elementary Schools that are also in top Middle and High School attendance boundaries. The good news is that there are 14 �trifecta�s� where all three K-12 schools exceeded a score of 86 on last year�s AIMS tests; significantly more than the last time we ran this analysis. 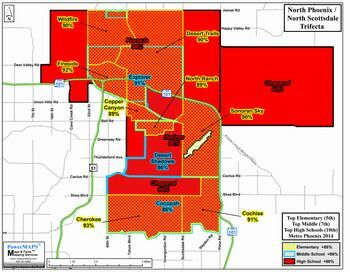 As an upcoming article in the Phoenix Business Journal will show in more detail, with the exception of Scottsdale�s Cherokee Elementary School, house prices in these 13 Elementary School neighborhoods range from $250,000-$500,000. You don�t need to be a millionaire to send your children to top schools! 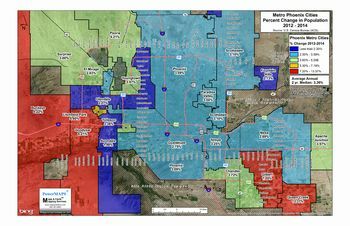 On October 1st Buckeye, Chandler, Gilbert, Goodyear, Maricopa, and Queen Creek will begin a Special Census to count (vs. estimate) their mid-decade populations. It will be interesting to see how these counts compare with 2014 population estimates. 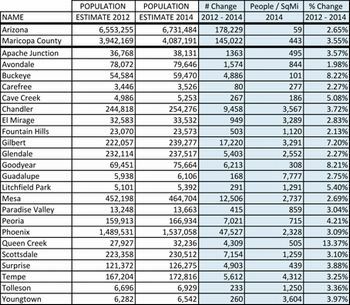 As an update to our previous May 2013 Map of the Month depicting Metro Phoenix population growth from 2010 to 2012, Maps & Facts has mapped the Census Bureau�s estimated population growth from 2012 to 2014 . As shown on this month�s map, the median 2 year population change was 3.36%, or, 1.68% per year. All good. But density and small area analyses are critical when making real estate decisions. 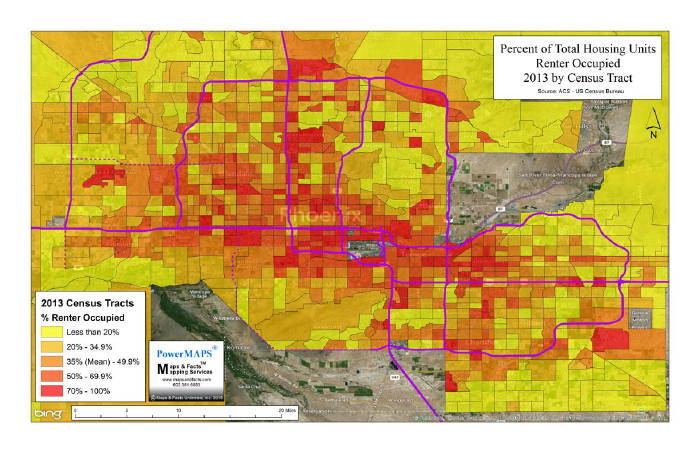 As the attached chart indicates, except for Guadalupe, Tempe with 4,312 persons per square mile has the highest population density accompanied by an average population increase of 3.25%; which mimics the Metro median. 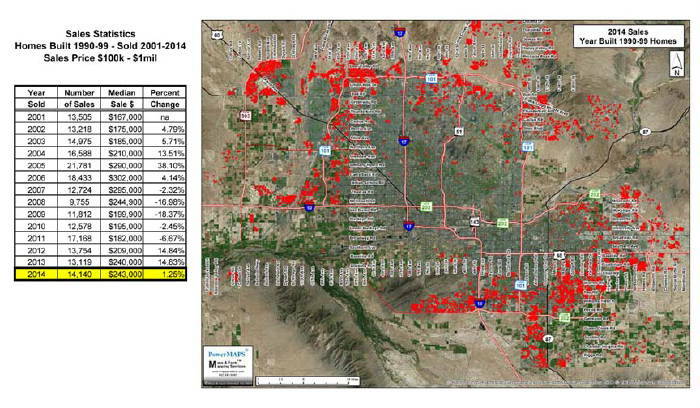 Phoenix, geographically the largest city, has �only� 2,328 people per square mile and grew 3.09%. While large area numbers are positive for overall future prosperity, they may not accurately depict small area submarkets which may have declining populations. For example, our January 2014 Map of the Month highlights the importance of knowing your sub-market. 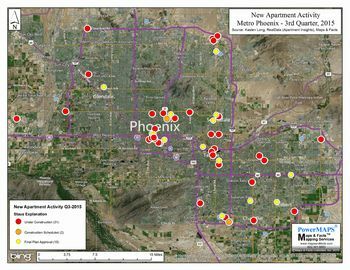 We recently researched the following apartment data found on Kasten Long Commercial Group�s website as sourced by RealData, Inc. (Apartment Insights). The big picture is that as of 3rd Quarter 2015 there were 9,240 apartment units either Under Construction, Construction Scheduled, or with Final Plan Approved in 48 locations, and, another 10,487 units (in 42 locations) in various preliminary planning stages. This month�s map plots the locations of the Under Construction, Construction Scheduled, and Final Plan Approved projects. 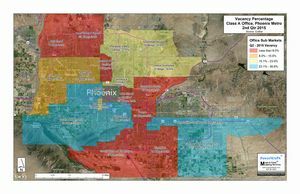 As shown, there are three primary core clusters: Midtown/ Downtown Phoenix, Camelback Corridor, and Downtown Tempe. 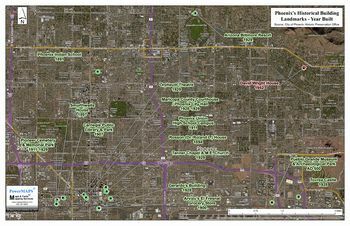 The majority of the remaining projects, especially those Under Construction, are located near Loops 101 and 202. This suggests apartment dwellers want to be in core locations or near freeways with access to employment. While these are big numbers, they still don�t match the last apartment peak in 1984 (30 years ago!) when 33,000 units were permitted. PS: By 1988, the vacancy rate was 14%. If you would like a complementary map of the individual categories just let us know. On November 16th the David & Gladys Wright house, designed by Frank Lloyd Wright in 1952 for his son and daughter-in-law, was designated as a historic �Landmark� and added to the City of Phoenix�s Historic Property Register. However, there is a significant distinction between a landmark and a historic property. 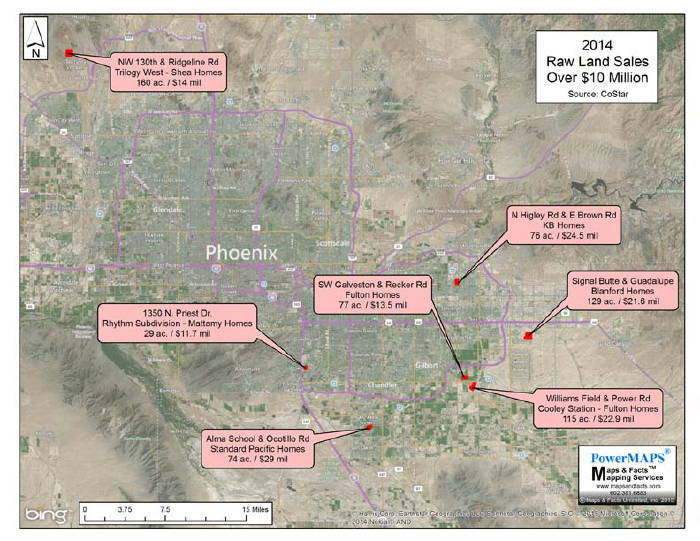 Given Phoenix�s comparatively young age, we wondered how many other �Landmark� properties there are in Phoenix. As this month�s map shows, there are very few. Media have been focusing on millennial�s (Generation Y, Echo Boomers) roughly 18 to 36 years old and estimated to be 80 million strong. Lost in The Cloud are Baby Boomers, US born between 1946 and 1964, 51 to 69 years old today. Originally 77 million strong; perhaps 70 million strong today. While the statistics vary, what�s most striking is that for the first time in modern history, the Census Bureau projects that until the mid-2030�s the number of people 65 and over will far exceed the number entering the 15 to 64 working age population. The question is: �For the next 20 years, can the declining number of workers under 65 support the booming number of 65+ year olds�? This month�s map focuses on where Metro Phoenix�s Baby Boomers congregate. As shown, there are many well defined over 55 sub-markets.